At the west end of the street, on the highest point overlooking the town and the bay, the Pilgrims built a two-story fort, from which they could defend the town. The Pilgrims feared that the French or Spanish (or pirates) might attempt to attack the colony. They also feared that unfriendly Indians could mount an attack on the colony. The Pilgrims had brought with them several different types of cannons, which they hauled up to the second story of the fort and mounted in a way that could command the whole harbor. The largest was a minion cannon, which was brass, weighed about 1200 pounds, and could shoot a 3.5 pound cannonball nearly a mile. 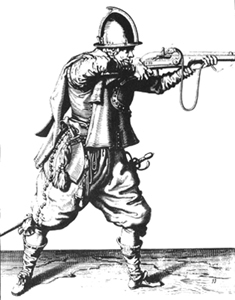 They also had a saker cannon of about 800 pounds, and two base cannons that were much smaller, perhaps about 200 pounds and which shot a 3 to 5 ounce ball. Various other gun ports in the fort could be opened and closed for the smaller cannon to be moved and pointed in any direction necessary. Observation windows provided a clear view of the town, the harbor, and the nearby woods. By 1627, Plymouth's fort had six cannon, plus four small ones positioned near the governor's house at Plymouth's main intersection. The fort served not only for defense, however. It was also the Pilgrims meetinghouse, where church services, town meetings, and court sessions were held. Captain Myles Standish was the Pilgrim's military leader, responsible for organizing the militia and defending the colony. He had been a lieutenant in Queen Elizabeth's army and was stationed in the Netherlands, where he made friends with the Pilgrims and their pastor, John Robinson. He is remembered as having been unusually short, with ruddy-red hair, very faithful and loyal, yet with a quick temper that often made his face turn red, earning him the nickname "Captain Shrimp" by some of those who did not like him. He was routinely elected and re-elected to the position of militia captain throughout the first few decades of the colony. He was responsible for training the men in the use of their armor, guns, and cannon; he established and appointed the watch shifts, and organized and trained the men for various forms of attacks that could be made against the colony. 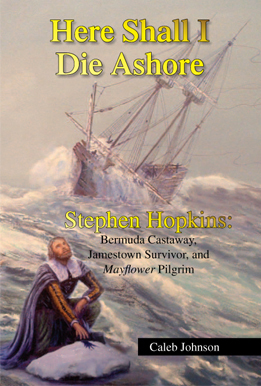 Luckily for Captain Standish, there were never any direct attacks on Plymouth itself, though the town occasionally sent him and some of his militia to help other neighboring English colonists with their disputes with the Indians, and they occasionally used the militia to arrest trespassers or others that were violating the terms of their trading contracts or otherwise causing problems. A Pilgrim suit of armor. A reproduction of the Pilgrim fort at the Plimoth Plantation Museum in Plymouth.